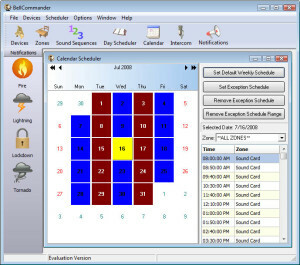 BellCommander is easy-to-use and affordably priced, starting at $79.95 for the sound card version. Other school bell software applications are priced at hundreds of dollars more with fewer features and do not have the expandability of BellCommander. Client PCs and Macs – Play school bells and send live pages to computers around your school or company. Each client can receive different audio, so bells and pages can be targeted to individual classrooms. Network Audio Devices – Connect small devices in each classroom to play school bells and pages or connect network devices to amplifiers to provide audio for larger areas. Analog Phone System Paging – Schedule audio pages and bells over a phone system using an analog port on the phone system. SIP Phone System Paging – Schedule audio pages and bells over IP phone systems that support SIP endpoints. Public Address Systems – Connect an audio cable from the PC to your school’s PA system and play school bells over the existing public address system. Low cost and easy-to-program alternative to mechanical and electronic school bell timers. Network and USB Relay Controllers – Control existing school and factory bell systems and devices such as as sirens, strobe lights, signal lights, and more. Perfect as a replacement for hard to program and manage mechanical and electric timers. Stand-Alone PCs – Play audio files locally on a PC. Great for simple reminders or for setting bells for a specific classroom. This configuration is often used in schools which have each classroom on a specific schedule.